It was last June when I first learned about dried limes. There was a story in the NY Times about their use in cuisine from Iran and Iraq, exactly how they’re used both whole and ground, and their unique, complex flavor of citrus with a slight funky edge. I immediately called Phoenicia, our nearby Middle Eastern market, learned they did have dried limes for sale, and ran straight there to get them. Dried limes are just that, whole, dehydrated, sun-dried limes. You should wash them before using them. Then, you can either pierce them and drop them whole into soups or beans as they cook, or you can chop them and then grind them in a spice grinder or coffee mill. If you grind the chopped pieces, you should shake the ground lime through a sieve to remove any large, hard bits. I tried two of the recipes from the NY Times article, the lentil salad and the broiled shrimp, but I never got around to mentioning them here. I recall that for the lentil dish, the dried limes were pierced and placed in the pot with the lentils while they cooked. The flavor they imparted was very subtle, and if I hadn’t known I’d used the dried limes I don’t think I would have picked out their flavor in the dish. For the shrimp, a paste was made with ground dried lime, other spices, and olive oil, and that paste was used as a rub on the shrimp. In that dish, the flavor from the limes was present, interesting, and enjoyable. I intended to try that again and grill the shrimp rather than broil it, but I just never got to it. All of this explains why I was so eager to try this quinoa salad from the book Plenty . I already had dried limes in my pantry, and I couldn’t wait to use them again. 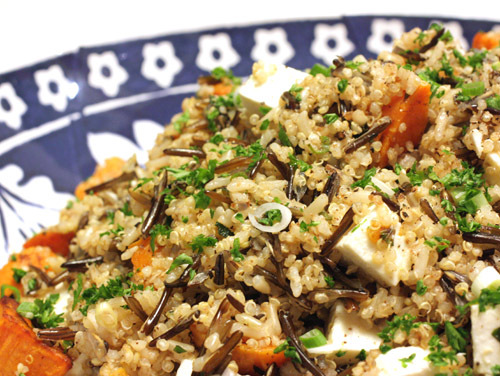 There are a several great-looking mixed grain salads in that book. 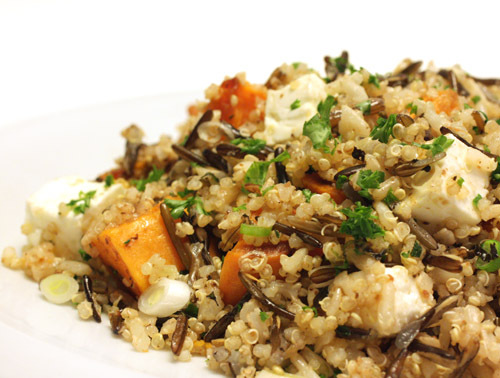 Here, quinoa, wild rice, and basmati rice were mixed with roasted chunks of sweet potato, herbs, sliced green onions, and feta. 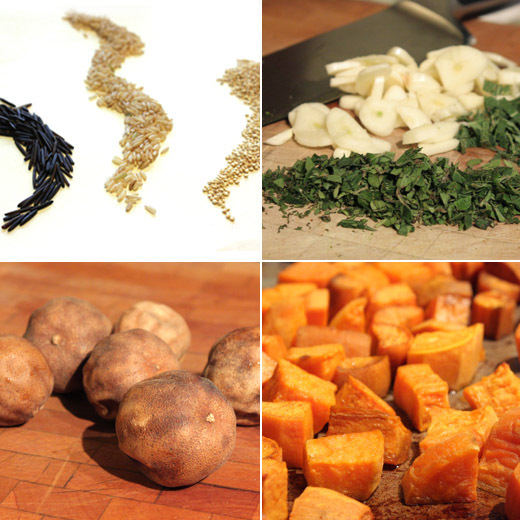 I had just received sweet potatoes and green onions from Farmhouse Delivery, so I was set. I bought Canadian Lake wild rice, which is a long variety that requires about 55 minutes to cook. I cooked it in a large saucepan with plenty of extra water, and added the basmati rice after about 15 minutes of simmering. When the two grains were cooked, they were drained and placed in a large mixing bowl. Meanwhile, sweet potatoes were peeled, chopped into cubes and roasted with a coating of olive oil and a sprinkling of salt and pepper. For the last 10 minutes of roasting time, the quinoa was cooked in simmering water, and then it was drained and added to the rices. Dried limes were chopped, ground, and sieved, and two tablespoons were used in the salad. Last, olive oil was heated in a small skillet, sliced garlic was added followed by chopped sage and oregano, and I was lucky to still have some sage and oregano in my herb garden after our cold spell. The oil with garlic and herbs was poured over the grain mixture followed by the roasted sweet potatoes and the oil left on the baking sheet, the sliced green onion, a little lemon juice, some shredded mint, the ground dried lime, and cubes of feta. Everything was carefully mixed so as not to break up the sweet potato or feta. This was such a pleasant mix of nutty, chewy grains, and the garlic, onion, and herbs hit all the right flavor notes. The dried lime with its concentrated citrus was well-matched with the sweet potato and feta. You could easily add more of one thing or less of another here, but I wouldn’t change a thing next time I make this. It was a meal of a salad, and since it makes a nice, large quantity, it will be several meals. I’m already looking forward to the next one for lunch. A beautiful dish! What an interesting and original combination. fascinating detail about dried citrus (no, I mean it)! I know preserved lemons are all the rage right now, but dehydrated limes? Definitely into the warm grain salad idea and have some wild canadian rice (haven't cooked it yet because 55 minutes requires patience! ), but no idea where to get dried lemons or limes. Can one fabricate ones' own in a cool oven, do you think? Jonny: Making your own dried limes might be worth a try. It may take several hours though. They are completely dry and hard all the way through. I love the mix of grains you have used. They create a complex flavor and texture profile. I absolutely love Quinoa! The idea of drying limes is facinating. This is on my list to try! Nicely done! the salad sounds delicious, love quinoa and love your choice of rice. O I start to feel healthy by just looking at this salad! I can imagine this must be great and I love quinoa so bookmarked! This sounds like a perfect dish for a light meal all by itself. I make dried lemon slices and pulverize them and add them to lots of dishes. I wonder if it's a particular type of lime that they dry. I failed to mention in the post that the dried limes are shown in the bottom left photo of the group of four. I love dried limes! I was introduced to them by my Iranian friends in LA and learned to detect their subtle flavor; then I realized they are used throughout the Gulf by other countries as well. great salad! The idea to make one's own is appealing, but can one find the same limes (loomi)? A terrific combination of nuttiness, citrus, and refreshing herb flavors, very healthy and delicious! I have seen dried lime in middle eastern cooking stores, but have never tried it. This salad looks absolutely delicious and is super exotic. A very different quinoa salad! Love all the ingredients in the salad. I think I've unintentionally dried a lime that before...in the bottom of my garage fridge drawer...lost and forgotten! Wouldn't want to cook with that one though. Love this hearty winter salad! Wow- looks delish! I'd never seen/heard of dried limes before. It sounds like they add a nice nuance, though. Ever since I read your interview with Ottolenghi, I've been meaning to pick up one of the books. I'll probably start with The Cookbook since I hear it has a great macaron recipe. Thanks for the reminder! Oh the dried limes sound so good. I have never seen this. I can't wait to make this!! I love salads like this - especially in the summer - makes a great lunch since all you have to do once it's made is scoop and eat!!! Will have to look for the dried limes next time I'm in our local middle eastern market! I have a little packet of pulverized dried lime that I've been meaning to use. Now, thanks to you, I know a great dish that it's destined for. It was in your blog that I had first read about the dried limes. Quinoa is something we love and the ease of cooking and the versatility adds to its qualities. Lovely salad full of exotic flavors Lisa. Oh Lisa, I am jumping up and down on this one! Dried limes! Love dried lime, and this dish sounds just perfect with them. The first time I bought them I was intrigued by the idea but had no idea what to do with them, they stayed in my pantry a long time. WOW does that ever look good. That combination of flavors sounds terrific, and now I want to explore dried limes!